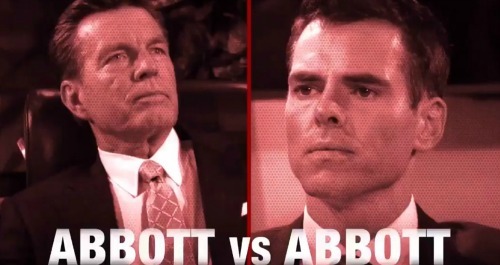 The Young and the Restless (Y&R) spoilers update for the week of October 2 tease that we’ll see some tricky situations. First, Nick (Joshua Morrow) will fume over Victor’s sneakiness. He’ll realize his father worked with Kevin (Greg Rikaart) to steal millions from his bank accounts. Chelsea (Melissa Claire Egan) will grow concerned when Nick vows to seek revenge. She’ll fear that this war may never end! Meanwhile, Cane (Daniel Goddard) and Lily (Christel Khalil) will face some difficult moments. After they fill Charlie (Noah Alexander Gerry) and Mattie (Lexie Stevenson) in on their divorce, they’ll all have to figure out how to move forward. Cane will promise that his love for Lily will endure, but Juliet (Laur Allen) will hope to make him forget about his ex. Speaking of exes, The Young and the Restless spoilers state that Victoria (Amelia Heinle) will get on Phyllis’ (Gina Tognoni) last nerve. Phyllis will once again urge Billy’s (Jason Thompson) former flame to back off, but Victoria has no intention of pulling away. In fact, Victoria and Billy could grow even closer after a crisis hits. Y&R spoilers say phase one of Jack’s (Peter Bergman) plan will be a huge success. He’ll be ecstatic when Billy takes the bait they planted. With any luck, Brash and Sassy will face a setback that’ll be tough to recover from. Other Young and the Restless spoilers reveal that Crystal (Morgan Obenreder) will finally be rescued. Alice (Tamara Clatterbuck) will grab Leon’s (Renes Rivera) gun during a dramatic faceoff. Crystal will ultimately rush into her sister’s arms, so some sweet scenes are ahead. Tessa (Cait Fairbanks) will be relieved and grateful, but she’ll still have problems to sort out. The Young and the Restless spoilers say Tessa will open up to Noah and he’ll do his best to offer advice. Maybe Tessa is picking up on Mariah’s (Camryn Grimes) strange behavior. Mariah has been trying to confess her feelings for Tessa, but she can’t seem to find her nerve. Perhaps Mariah will give it another shot soon. Elsewhere, Scott (Daniel Hall) will realize something’s rotten about Zack (Ryan Ashton). Abby (Melissa Ordway) will dismiss Scott’s warning, but he’ll continue to dig. It looks like Scott will discover that this dating app isn’t exactly kosher. Abby will run into major trouble as Zack’s dark side takes over. Across town, Devon (Bryton James) will be stunned by Hilary’s (Mishael Morgan) next move. If she shows some vulnerability, she’ll surely pull Devon even closer. These two appear to be on the road to a reunion, so Y&R fans will want to keep an eye on their bond. It sounds like some great episodes are coming up. We’ll give you updates as other news emerges. Stay tuned to the CBS soap and don’t forget to check CDL often for the latest Young and the Restless spoilers, updates and news.